Peyto Lake is one of the most inspiring sights that can be seen within the Banff National Park. This protected area is located in the Rocky Mountains of Canada, about 130 km from Calgary, covering an area of about 6641sq.km. Spectacular natural scenery from lush meadows, crystal lakes and high peaks can be found within Banff, which is included in the UNESCO list of World Heritage Sites. 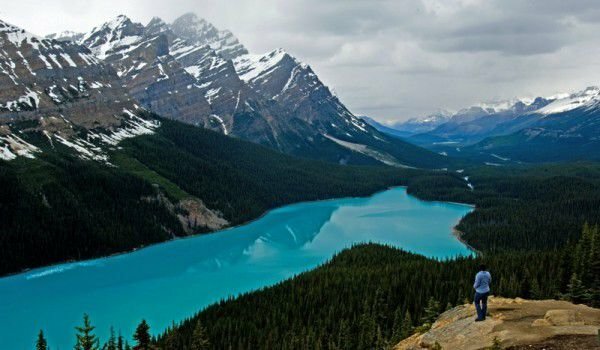 Peyto Lake is popular with its turquoise clean waters, which annually attracts nearly 4 million visitors in Banff National Park. turquoise beautiful blue water turns Peyto iton one of the most photographed sights in the park, and you can regularly see the lake as an illustration on multiple calendars, cards, encyclopedias etc. Indeed the turquoise color of Peyto is due to the fact that during the summer months it runs into so- called rock flour, which influences the mineral content. For many, the panorama of the lake Peyto is one of the most beautiful and emblematic of Canada. The water basin is located directly in the picturesque foothills of the surrounding mountain peaks in the area of the vast valley. Access to Peyto is extremely easy, as a starting point for route to it one has the panoramic views of the Icefields Parkway, which is located about 40 km north of Lake Louise. The park trail is well marked by signs and navigation to make it easier for tourists to reach Peyto. The highest point on the Icefield Parkway is Bow Summit and it is from there we find the best views of all of Peyto Lake. Waters of Peyto lake are fed by the eponymous glacier, which can be seen on the left side in the distance, in place to monitor the lake. Peyto extends a total area of 5.3 square kilometers. The length of Lake Peyto reaches a maximum of 2.8 km and its width is about 0.8 kilometers. Lake Peyto was formed at an altitude of 1860 meters, and is locked between the valleys of the Waputik Range, between the heights of Caldron Peak, the eponymous Peyto Peak and Mount Jimmy Simpson. The name of the turquoise glacial basin comes from the trapper and guide in Banff - Ebenezer William Peyto.